I am excited to introduce a new family member – Rendezvous. 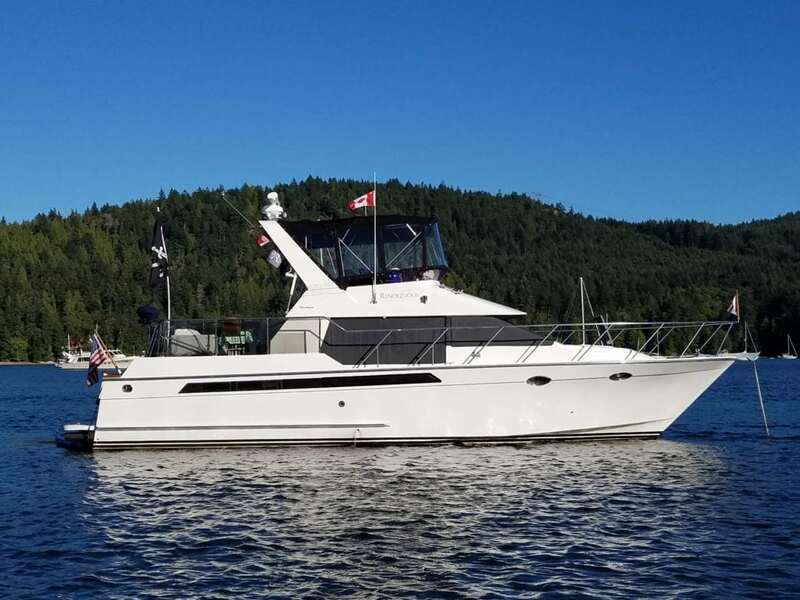 She is a 1988 Ocean Alexander 420 sundeck motor yacht with lots of neat features and extras. After a whirlwind process of selling Grace, Rendezvous became part of our family in early November. This was after I made my decision to switch from sail to power which I discussed in Sailing towards power. Making the decision to sell Grace was hard, but once that was done, getting her ready was an even bigger job. You don’t really realize how much stuff you have on a boat until you try to take it all off! After a good week of work, not only was everything off, but all of the nooks and crannies were clean, and she was ready for a wax and wash. 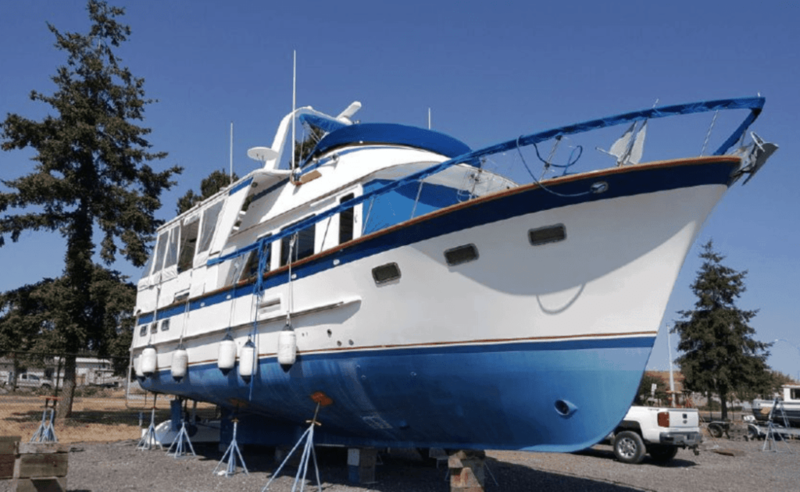 Soon, she was show ready, and after a week or so for sale on my own, I listed her with Signature Yachts, the broker I bought her from and have had great experiences with in the past. After only a day, I had a buyer, a week later a survey, and things were progressing on the sale of Grace. In the mean time, I had visited a number of potential boats and found that the layout and style we most preferred was a cockpit motor yacht, or tri-cabin setup. The main points from this sort of layout include an island queen master cabin in the stern, a large salon, and a decent sized v-berth in the bow. After looking around at various manufacturers, it became clear that this layout would narrow down the choices considerably. I looked at a number of Tollycraft 44, an Ocean Alexander 46, several Hatteras, and Island Gypsy, and two DeFever 44’s, plus some other random ones I don’t remember. I didn’t particularly care for the fit and finish of the Tollycraft, although the space was laid out well and seemed quite large compared to others. 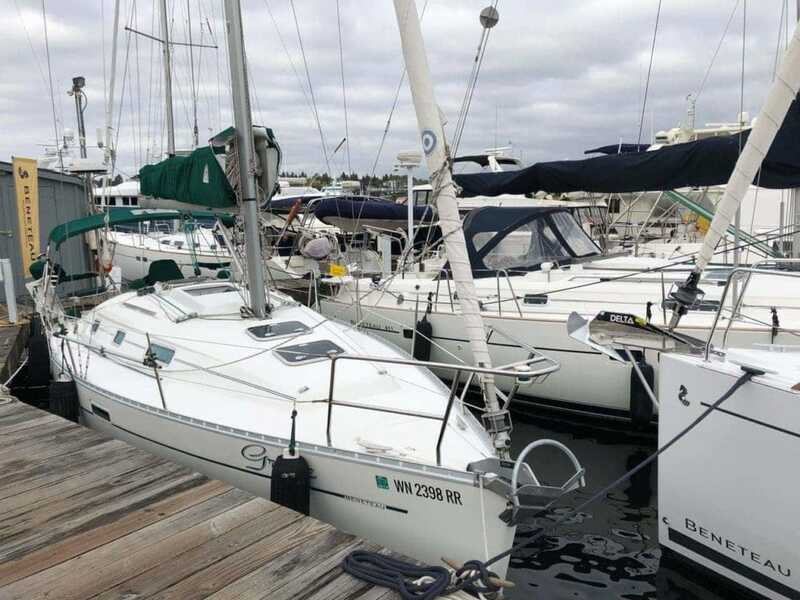 Not only that, but finding a Tolly 44 for sale was proving difficult – they seem to be snapped up quickly. I also found one with Detroit Diesel engines, which I am not a fan of. 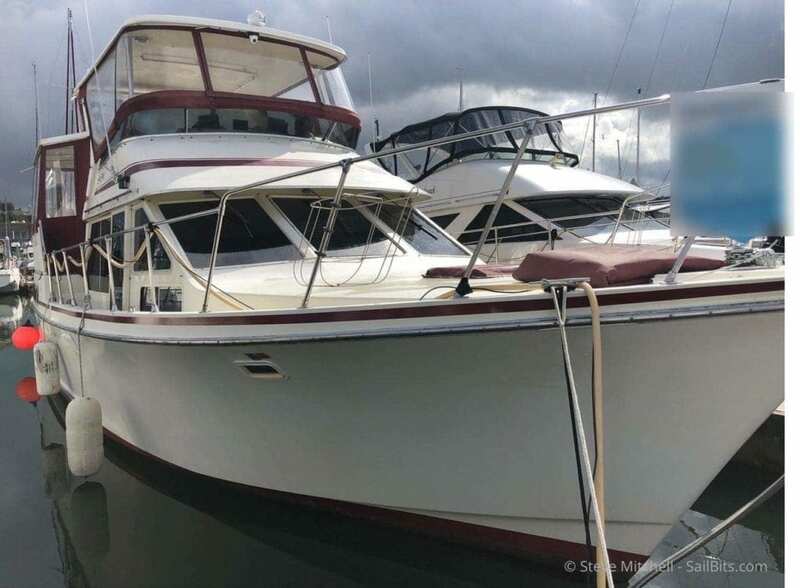 We did end up making a conditional offer on a Tolly 44, but we were competing against another offer which eventually won out, which was probably good! The primary boat in my list initially after making my decision was the DeFever 44. I loved its lines and the stand up engine room, along with the interior layout and finish. 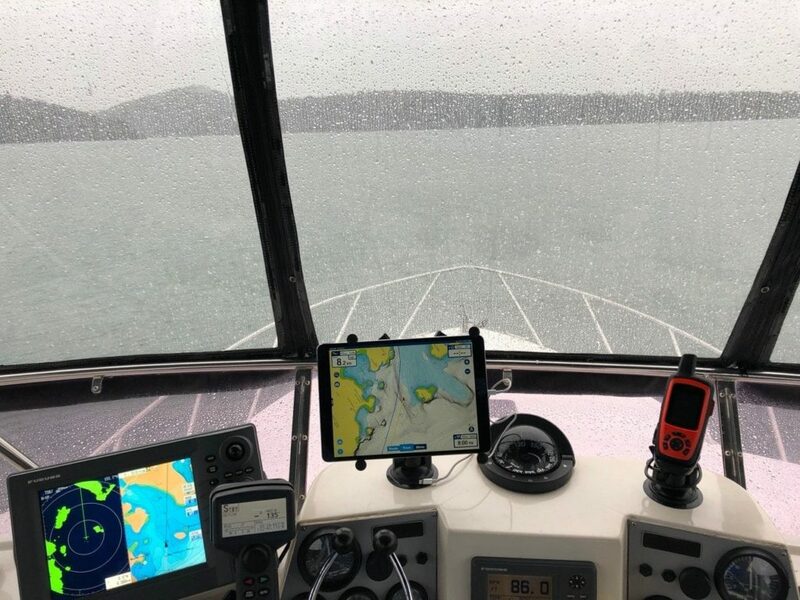 I visited two in the local area, and I still love the stand up engine room, but the rest of the boat gave me concerns once I started thinking about using it. Not only was the salon much smaller than the Tolly (and many other tri-cabin boats) but getting aboard because of the high freeboard was going to be a concern. The interiors were beautiful with tons of teak and storage, but it was very compact and not as open as I would like. Josh also did not like the layout at all, and being the first mate, that opinion counted a ton! The other manufacturers had interesting features, but the one that stood out to me was Ocean Alexander. I had only had exposure to their newer 2000’s and later models via visiting some friends boats. In learning about their history, and seeing the 1980-1990’s vintage hulls, I was really surprised at the quality and performance, comparable to all of the other manufacturers I was considering. 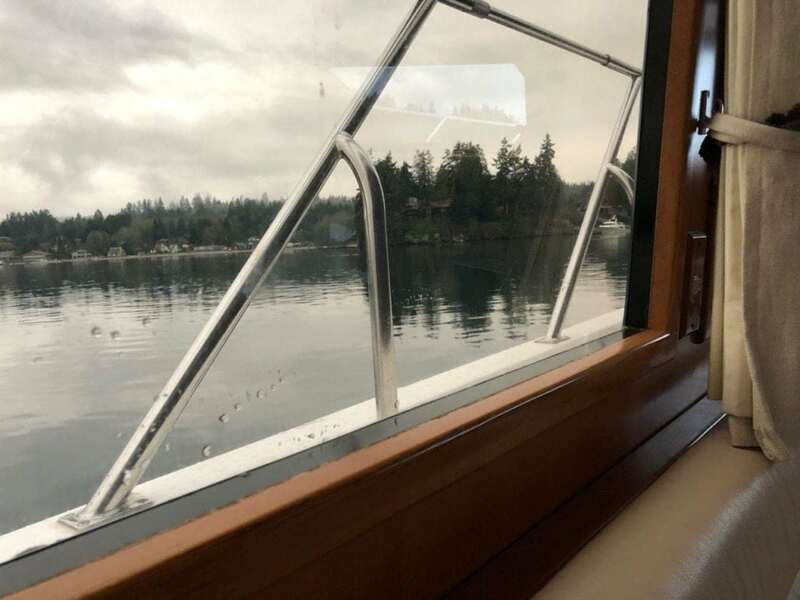 I saw two mid-1980’s Ocean Alexander sedan models in the Seattle area, and while beautiful, the layout didn’t match our tri-cabin desires with a large stern queen master berth. Nevertheless, it gave me direct experience with the quality of the finishes, build, electrical system, and more. OA’s were truly built at high quality standards. Just by chance, days before the Seattle Boats Afloat show, I saw a 1988 Ocean Alexander 420 Sundeck come available on Yacht World. 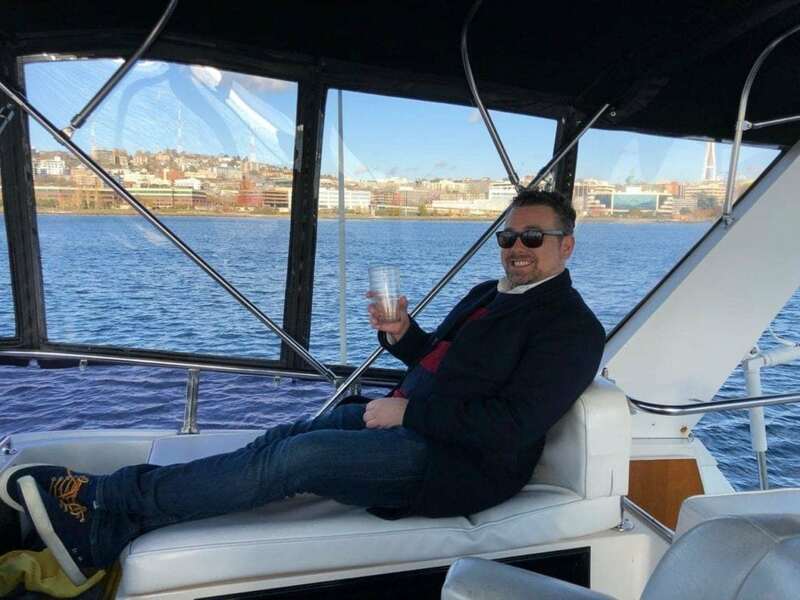 I met Matt Maynard of Irwin Yacht Sales at the last minute right after the show, and walked aboard Rendezvous. I knew the moment I stepped aboard that this was our next boat. She was immaculately cared for, and looked about 10 years old, not the 30 she really was. Both inside and outside she had everything we wanted, and felt like home. I also saw a 1987 Ocean Alexander 46 a couple of hours later which had been a custom layout when built, which was slightly odd and not as functional. It had also been used quite heavily and looked like a 30+ year old boat. But the quality was still very impressive. Later that day, I put an offer in on Rendezvous, contingent on Grace selling. 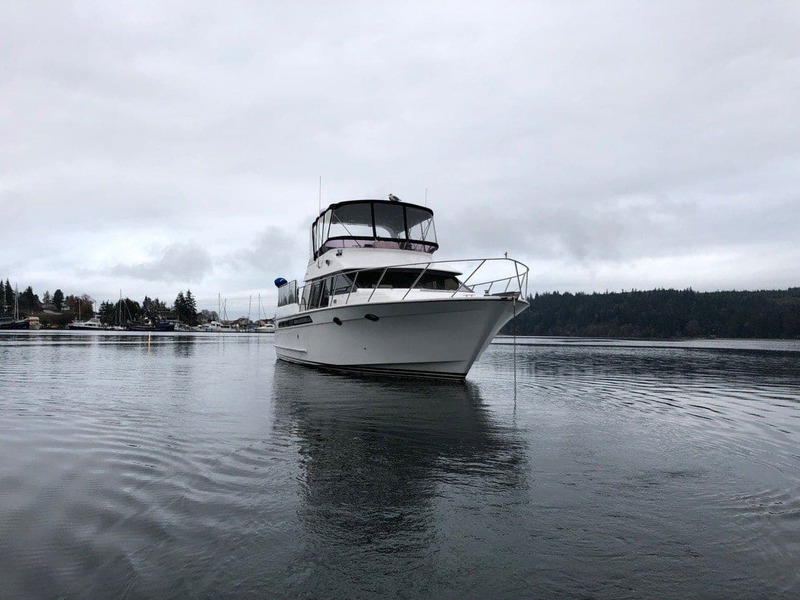 A survey and mechanical inspection was set for mid October, and we were on our way to buying a new boat! But as with anything boat-related, it wasn’t that simple. Only a couple days from the survey date on Rendezvous, my buyer on Grace fell through due to financing. I was devastated, as I knew that Rendezvous was the boat for us, but we couldn’t afford it unless Grace sold. 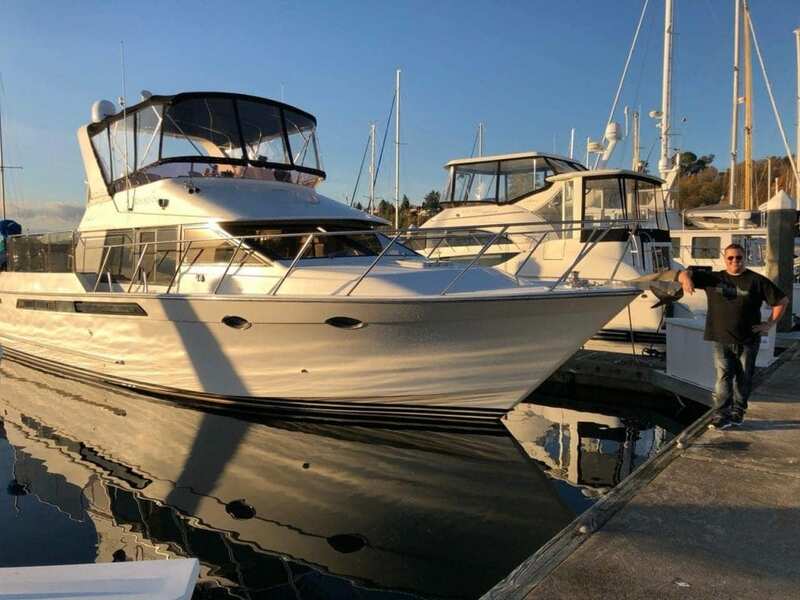 Grace was a pretty desirable boat – I had 6 different people within a day make offers or want to make an offer once we listed her with a broker. So, I texted/called back a few of the folks who had contacted me directly, and after only a day, Grace had another buyer, and we were back in the running! Survey day was super fun. I had requested John Sandford as my NAMS/SAMS surveyor – he had done the original survey on Grace, and I was very impressed with his thoroughness and no-nonsense approach to the process. I appreciate his style of identifying the real issues with the boat, and not just finding items to make sure something is wrong on the survey. I also had asked for a mechanical survey, and Kevin from Diesel Systems was my guy on that front. He spent hours in the engine room checking everything over, taking oil samples, and providing very clear guidance on everything mechanical. 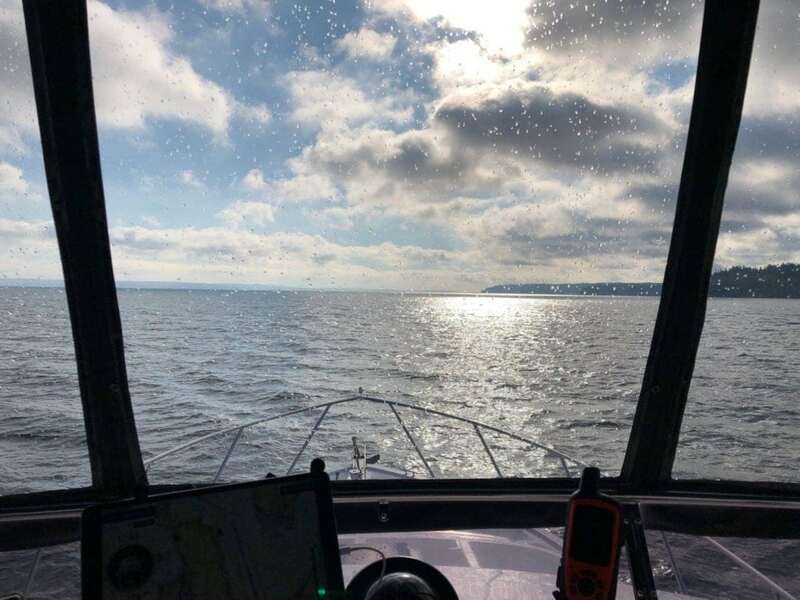 The survey started at 8AM, and included a thorough going-over of the entire boat, sea-trial for about an hour, and a haul out at nearby Marine Servicenter. The zincs looked like they needed to be replaced, so I paid for that (fully knowing at this point I had fallen in love with this boat) and poked around underneath. 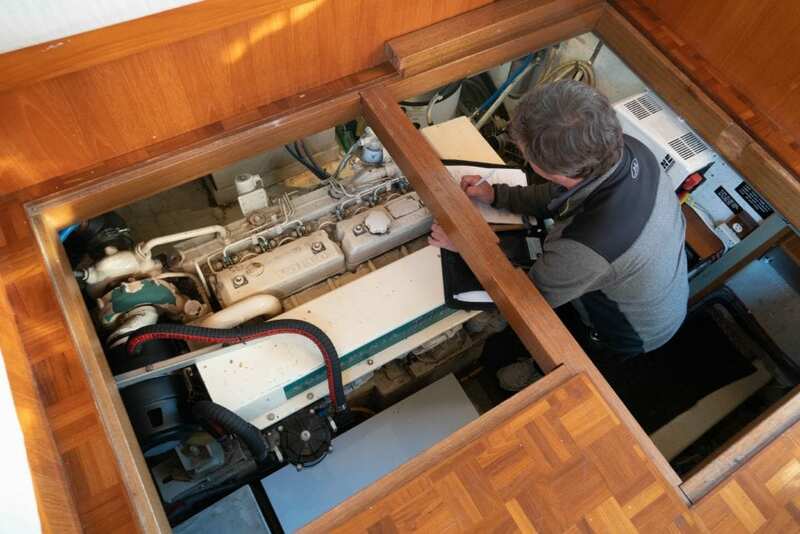 I wanted to hear the engine noise with all of the floor panels closed, and Matt was nice enough to go back out of the marina for another quick sea-trial to let me hear that. So quiet! We got back to her slip and John spent another couple of hours poking around in even more areas, and we all sat down to review the results. 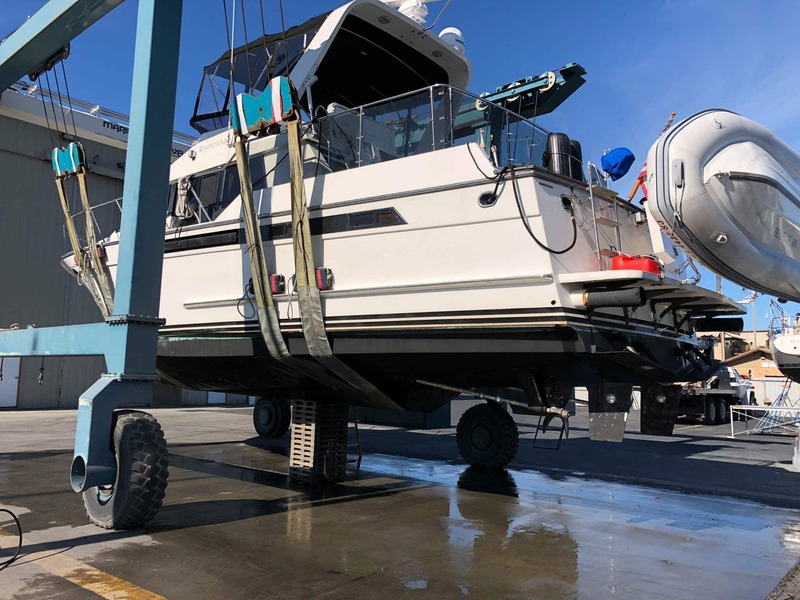 Overall, she was in excellent condition, with only some hose replacements to be done on various spots, and a few safety issues which were easily correctable. There was some additional maintenance required on an after cooler and some other random things that would be pretty easy to deal with. I was happy to proceed once we got all of the official reports back. That happened a few days later, including a detailed oil analysis on the engines, generator, and transmissions – everything was clean. Now all we had to do was wait for Grace to sell, and then all of the other money pieces to happen! That occurred soon enough, with Grace closing on Halloween, and Rendezvous only a few days later. Rendezvous was only owned by two previous owners, each for 15 years, making me the third. The current owner was willing to meet me on the day of closing and go over the entire boat in terms of his tips and tricks. We spent about an hour and a half on the boat, and then because we were in Anacortes, he rode with me back south to Seattle. This was a great opportunity to chat with the person who used the boat for so long, and knew things that you would have to figure out on your own, if ever. 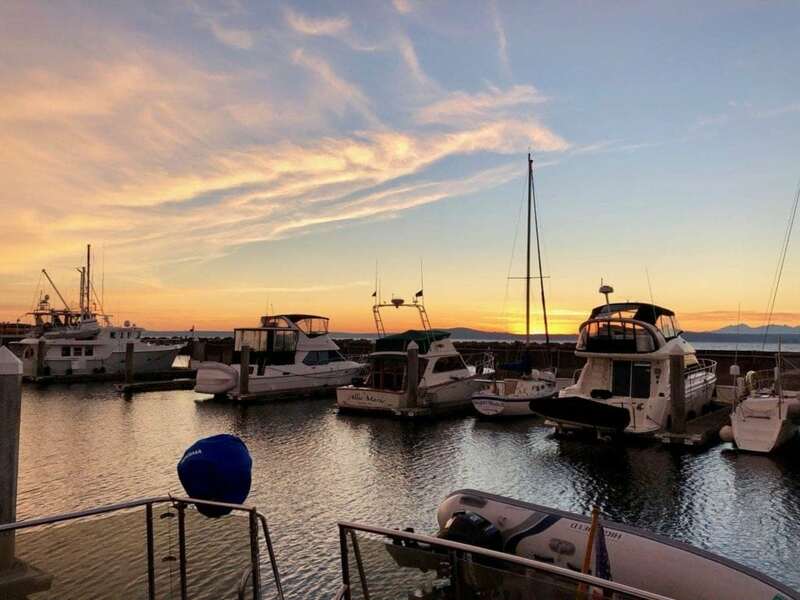 I went downtown and picked up a rental Chevy Tahoe, filled it to the brim with supplies, tools, and everything off of Grace, and headed back north that same day, arriving around 4pm at the Anacortes Marina. I spent Wednesday night and all day Thursday provisioning, learning, and familiarizing myself with the systems on the boat. I tested as much as I could at the dock for the solo 2 day journey south to Seattle. Friday morning I woke up to low clouds and rain, and at 8:30AM I cast off the lines, and backed her out of the slip. First time at the helm on a brand new boat, and a dual engine yacht which I hadn’t driven much of in 20+ years. It went fine, even in the tight corners exiting the Anacortes Marina. Once out beyond the entrance buoys, I put all the lines and fenders away, and did some tests with the engines and transmissions to become a bit more familiar with how she reacted. Then I headed out hopefully to go directly across the straits to Port Ludlow for the first night. Unfortunately within about 5 minutes I heard on VHF channel 16 that the Navy had part of the area I wanted to go through closed for live fire exercises. 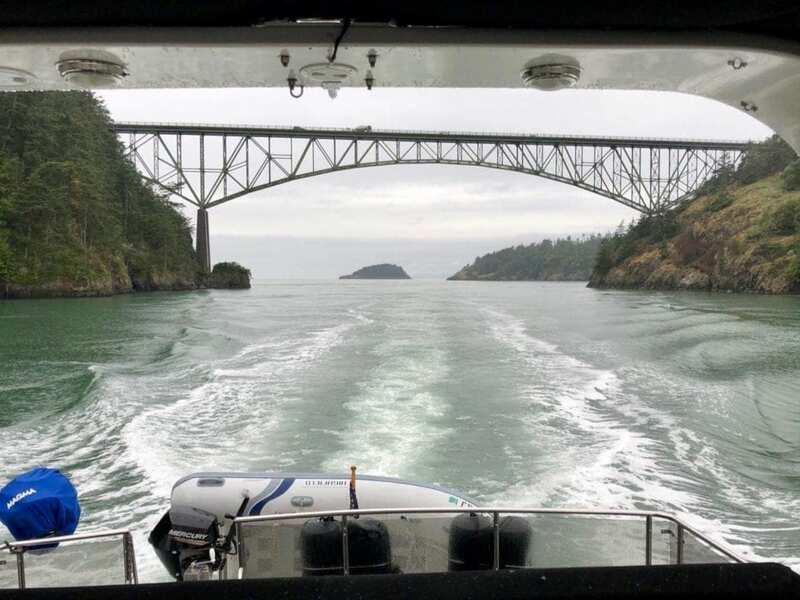 Even though I could have probably gotten around it, I decided that my alternate through Deception Pass was probably the safest thing to do. I got to the pass about 15 minutes before slack, and I am glad I made the decision to go that way. Visibility in general was less than a mile due to the sheer amount of rain, and driving from the fly bridge without a windshield wiper made for even more difficulty. I really didn’t want to be in the straits with the Navy somewhere out there in that sort of visibility. The chart plotter, radar and autopilot were also not working perfectly, which is OK since I brought two iPads with Navionics and TimeZero for primary navigation. The chart plotter seemed OK at times, but the radar was off 30 degrees from the image on the charts, and I think it needs to be calibrated. The autopilot was really wonky and I think the digital compass needs to be calibrated – all of this is pretty recent Furuno equipment and should work fine once I figure out the tuning issues. I decided to still go to Port Ludlow and anchor, as I wanted to arrive in Seattle at Elliott Bay Marina on Saturday with plenty of light for a first docking. I arrived in Port Ludlow around 2:30PM and dropped anchor easily. I was on the water for 7 hours, about 3 more than I expected, but I was really pleased with the way the boat performed in the weather, waves, and running through a difficult pass. Very, very pleased overall. I decided to take the new Highfield dinghy out for a spin, as I hadn’t had a chance to do that during survey. Wow! I’m impressed with the lightness of the aluminum bottom, and the speed with the 15HP motor – 20+ knots at full throttle with one big guy (me) in it. Port Ludlow was very quiet and empty, and the water was like glass all evening and into the morning. I had a wonderful dinner, enjoyed the big windows in the salon, and explored more systems on the boat. I left around 10AM the next day into beautiful weather – sun everywhere with a little bit of wind and waves. While crossing Foulweather Bluff there were actually some pretty big 3′ waves, and the boat just sliced right through them. I arrived at Elliott Bay Marina around 1pm, and decided to meet Josh at the fuel dock to top up the tank. My first docking attempt went off without a hitch – there was quite a bit of wind (not optimal!) when docking, and the fuel dock attendant caught my line and tied me down. After a larger bill than with a sailboat (!!) for about 175 gallons of diesel, Josh hopped aboard, and we went out into Elliott Bay. He had not been on the boat underway, and really loved it. We spend an hour and a half cruising around, and then called ahead to the marina for docking line assistance in our new slip. The wind was even worse, although once I made the turn into the slip, seemed to be less of an issue. The narrow fairways at the marina will definitely give me more practice in the coming trips! We docked without incident, and then ran off to prep the boat for visitors later that day and on Sunday. No rest! The author with his new boat! That night three of us enjoyed just being on a boat again, and the next day we took Rendezvous out for her first official cruise with guests over to Blakeley Harbor for a few hours during lunch. The wind was quite brisk at 20 knots coming back with big 3-4′ waves in the channel, and again she impressed all of us by being able to slice an angle through them with little impact. Beam on was a different story, but that’s not unexpected. LED lighting – much of the overhead lighting was replaced with LEDs, but they are a very harsh color. We’ll be replacing those. In addition, I will be adding LED strip lighting like I did on Grace in a ton of places for more ambient light instead of direct overhead fixtures. Oil change – this was due, and will be good for me to get used to. Ground tackle improvements – there is no bridle, and the anchor and some of the connecting hardware needs to be updated/fixed to make it safer. 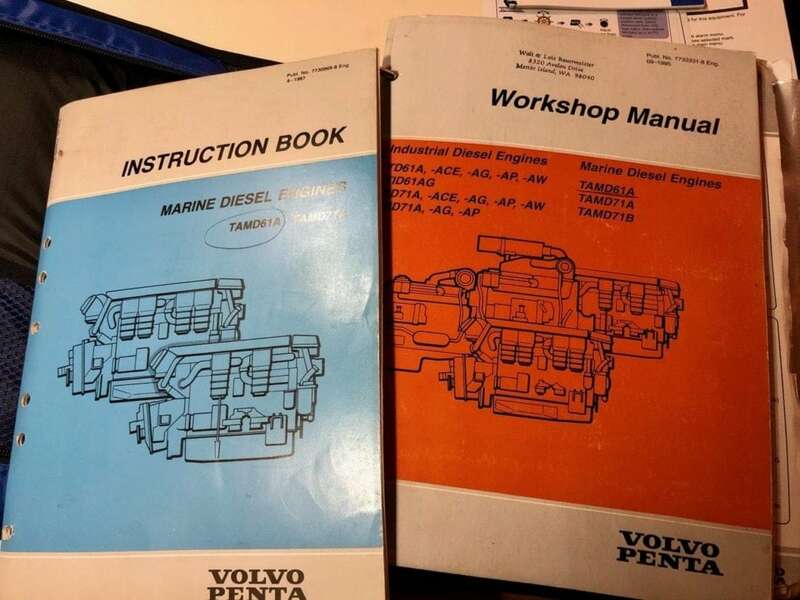 That’s just what I plan on working on the next 1-2 months – there’s a whole long term roadmap and project plan for the boat that I will publish later! Our friends and crew have already fallen in love with Rendezvous. 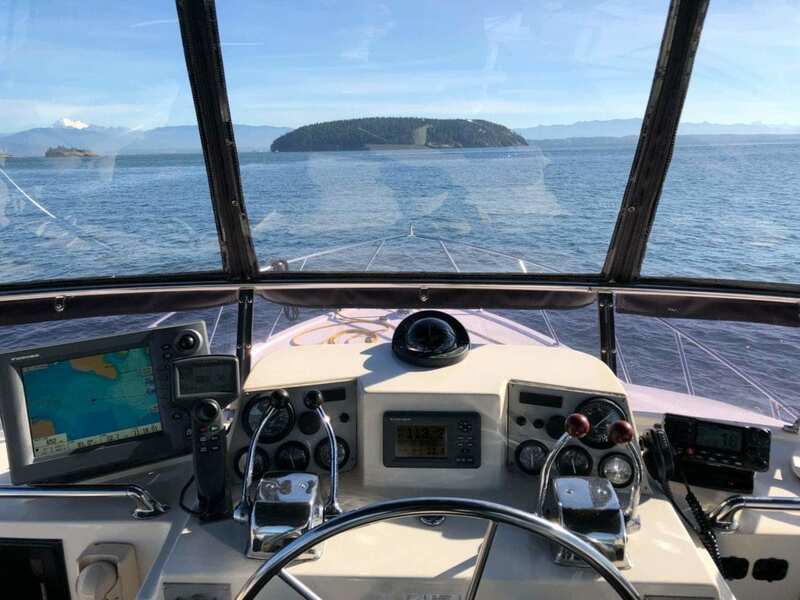 So have I – I love the space, the speed, and the comfort of her already feeling like home no matter if we are underway, at the dock, or at anchor. I can’t wait to share more testing, experimentation, networking, and trips with you! 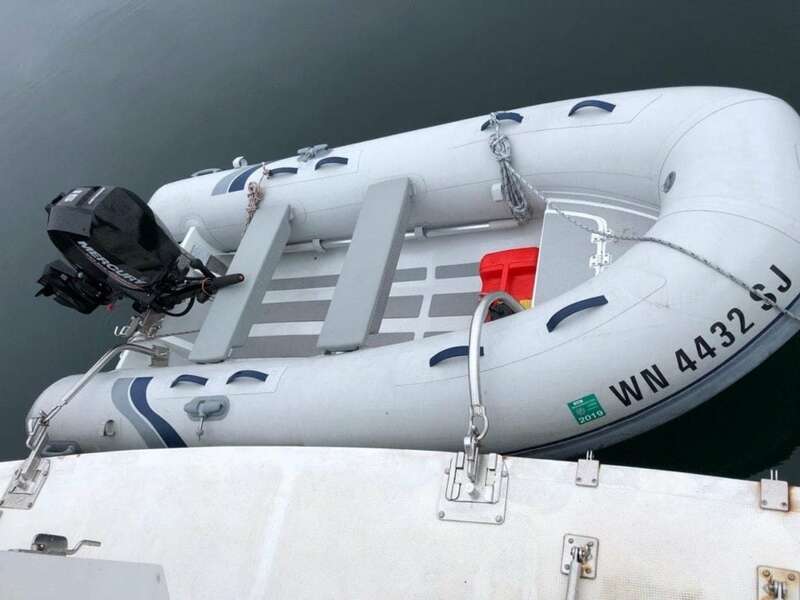 You can learn more about Rendezvous, her specs and more details at the m/v Rendezvous page.